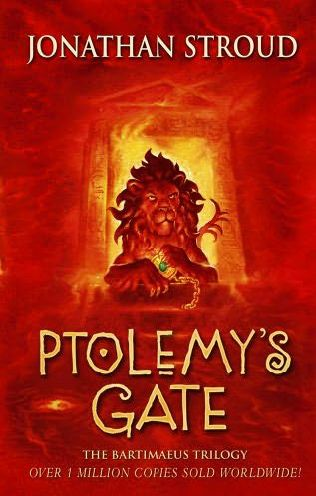 I remember when Ptolemy's Gate came out with surprising clarity. I'd read the first two installments of the series, loved them and then found out that the last part of the trilogy was yet to be released. So when I heard that the book was finally being released, I was hyped. I don't usually follow publishing schedules, so this is pretty unusual for me. So it perhaps wasn't a shock that when I finally did get to buy it, I read all but the last two chapters in a single sitting, interrupted only by my mum insisting that I had to go to bed. I think the only other book that came close to being so keenly anticipated was the third book of the Artemis Fowl series, which was devoured at a slightly more leisurely pace. I wanted the Bartimaeus trilogy to end as well as it had started, and I was by no means disappointed. Ptolemy's Gate again follows Nathaniel, who has had another rapid rise through the parliamentary ranks in the three years that have passed since the previous book. He is now Information Minister, in charge of the propaganda being forced onto the commoners, as well as informally looking after his previous Internal Affairs post. Considering that his main job is now to encourage the populace to support a failing and increasingly unpopular war in the American colonies, it means that he is positively drowning in work. That's not much of a consolation for Bartimaeus, who has been constantly in Nathaniel's service for the better part of two years, and it's really starting to show. Where he was once nimble, cunning and more-or-less capable, years of constant service has whittled his strength down to a fraction of what it once was. With mounting frustration and desperation, he is trying to persuade his master to dismiss him before he just disperses entirely. Elsewhere, Kitty has been making herself busy learning about spirits and summoning in her latest plan to bring down the magicians' rule: a plan which requires the assistance of Bartimaeus himself. And in the background, another conspiracy is at work, one more terrible and ambitious than both Lovelace and Duvall's previous attempts at coups. In my previous two reviews, I focused a lot on setting and theme, because they seemed to me to be some of the most interesting things to talk about after re-reading them. As a result, I have neglected to discuss my favourite part of the trilogy as a whole, namely the title character of the series: Bartimaeus himself. When I first started these reviews, that did bother me slightly, but it just didn't feel right at the time. It is only now in the final installment that I consciously realise why I refrained for so long. You see, Bartimaeus is kind of an oddity amongst many of my favourite characters in regards to the fact that he doesn't really change at all when it comes to personality or outlook. Certain individuals might rise or diminish in importance to him, but his overall character doesn't change. Honestly, why would it? He's thousands of years old, surrounded by people whose lifespans are minute in comparison and consistently has to endure the same old indignities by those same people. It doesn't make sense for him to have a traditional character arc. Instead, his character is revealed over the course of the trilogy in little chunks, with the most important parts saved for Ptolemy's Gate. I can't have been the only one practically begging to find out who Ptolemy was and why Bartimaeus still took on his appearance more than two thousand years after his death. Those sections didn't disappoint; by the end of the flashback sections in Alexandria, I was a heartbroken mess and wouldn't have it any other way. It's a story that fans of the series know is going to be tragic from the off-set, but I don't think it would work anywhere near as well if the relationship between Bartimaeus and Ptolemy hadn't been as good. I think the reason their relationship works so well is that at no point does Ptolemy treat the spirit as a symbol. That might seem like a strange thing to say, but hear me out. Nathaniel insists on keeping Bartimaeus in the world for two reasons: because he represents his precarious position in society due to the knowledge of his true name, as well as a link to his childhood and the adventure associated to that. Kitty's plan is initially scuppered because she sees Bartimaeus only as a reflection of the repression she experiences at the hands of magicians, not as someone that she is currently repressing herself, albeit unwittingly. Neither of them really considers him as a personality in his own right, and the realisation that they were short-sighted is a large, if understated, part of the plot's main drive.